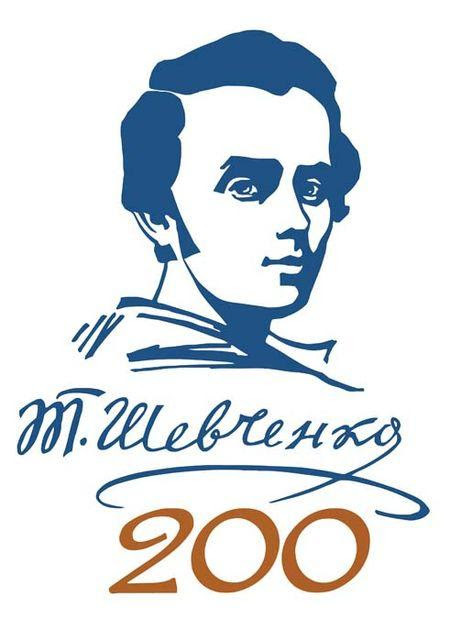 The Ukrainian World Congress commemorative insignia “200 years since the birth of Taras Shevchenko” was designed on the occasion of the 200th anniversary of the birth of Taras Shevchenko to recognize individuals for a significant personal contribution to the popularization of the cultural legacy and commemoration outside Ukraine of Taras Shevchenko. The insignia will be in the form of a medal featuring an image of Taras Shevchenko along with the words “200 years since the birth of Taras Shevchenko” and “Ukrainian World Congress”. The medal will be awarded together with a smaller replica in the form of a lapel pin and a Certificate of Achievement outlining the specific accomplishments being recognized. Ювілейна відзнака Світового Конґресу Українців “200 років з дня народження Тараса Шевченка” установлена з нагоди 200-ліття з дня народження Тараса Шевченка для нагородження осіб за значний особистий внесок у популяризацію творчої спадщини та вшанування Тараса Шевченка за межами України. Клопотання про відзначення ювілейною відзнакою Світового Конґресу Українців “200 років з дня народження Тараса Шевченка” подають складові організації Світового Конґресу Українців до 31 грудня 2014 р. Разом зі зверненням про нагородження подається біографічна довідка особи, яку представляють до нагородження. Відзнака встановлюється у вигляді нагрудного знака з зображенням Тараса Шевченка та словами “200 років з дня народження Тараса Шевченка” і”Світовий Конґрес Українців”. Відзнака вручається разом зі значком, який являє собою зменшене рельєфне зображення цієї відзнаки, та з нагородним листом, у якому зазначаються конктерні заслуги особи, що стали підставою для нагородження. Вручення ювілейної відзнаки проводиться в урочистій атмосфері та за широкої гласності. “200 років з дня народження Тараса Шевченка”. Як ми вже Вас повідомляли, 5 липня 2014 р. у зв’язку з 200-літтям з дня народження ТарасаШевченка Рада директорів Світового Конґресу Українців (СКУ) прийняла рішення встановити ювілейну відзнаку “200 років здня народження Тараса Шевченка”. Цією відзнакою СКУ нагородить тих осіб, які зробили значний особистий внесок у популяризацію творчої спадщини Тараса Шевченката у його вшанування за межами України. Відзнака у вигляді нагрудного знака із зображенням Тараса Шевченка та словами “200 років з дня народження Тараса Шевченка” і “Світовий Конґрес Українців” буде вручатись разом із значком зізменшеним рельєфним зображенням цієї відзнаки та з нагородним листом, у якому будуть вказані конктерні заслуги особи, що стали підставою для нагородження. Повідомляємо Вас, що звернення про відзначення ювілейною відзнакою Світового Конґресу Українців “200 років з дня народження Тараса Шевченка” приймаються до 31 грудня 2014 р.
Список осіб, які будуть нагороджені цією відзнакою СКУ буде оголошено на початку лютого 2015 р. 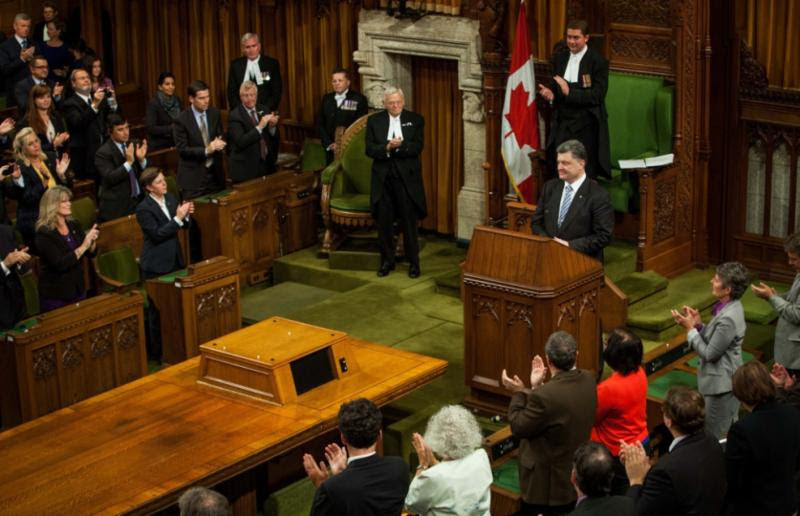 18 September, 2014 – Ottawa – The Ukrainian Canadian Congress (UCC) welcomes the visit of Ukraine’s President, His Excellency Petro Poroshenko to Canada. On September 17,President Poroshenko met with Canada’s Prime Minister, the Rt. Hon. Stephen Harper. Poroshenko and his delegation held a working meeting with the Prime Minister and members of the Cabinet; Poroshenko addressed a joint sitting of the House of Commons and Senate; addressed a United For Ukraine rally in front of Canada’s Parliament buildings; and met with the Governor General of Canada, His Excellency the Rt. Hon. David Johnston. President Poroshenko also had the opportunity to meet with representatives of the Ukrainian Canadian community. 18 вересня 2014 – Оттава – Конґрес Українців Канади (Конґрес) вітає візит Його Високоповажності Президента України Петра Порошенка до Канади. 17 вересня Президент Порошенко зустрівся з Прем’єр-міністром Канади, Високоповажним Стівеном Гарпером. Порошенко та його делегація провели робочу зустріч з Прем’єр-міністром та членами Кабінету Міністрів. Порошенко виступив на засіданні Парламенту; виступив з промовою в рамках громадського мітингу «United For Ukraine» перед парламентом Канади, і зустрівся з Генерал-губернатором Канади, Високоповажним Девідом Джонстоном. Президент Порошенко також мав можливість зустрітися з представниками українсько – канадської громади. 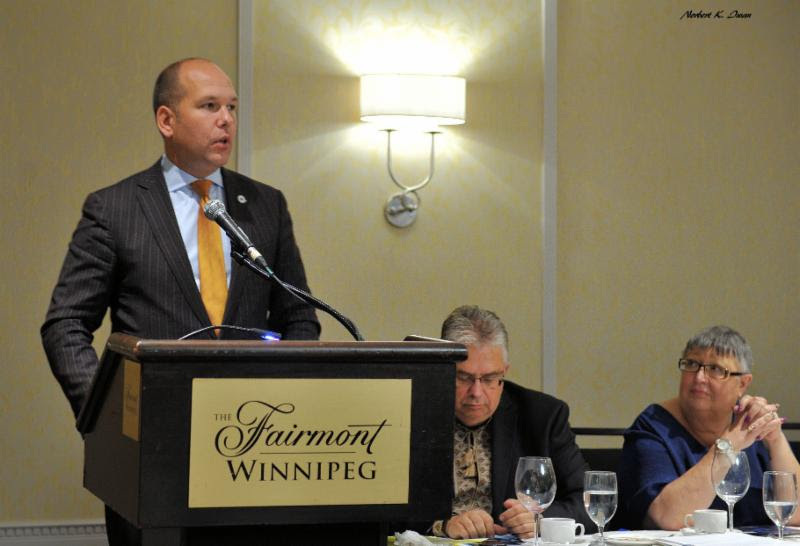 The UCC held its Annual General Meeting as well as its Board of Directors meeting on Saturday September 20 through Sunday September 21, 2014 in Winnipeg, Manitoba. 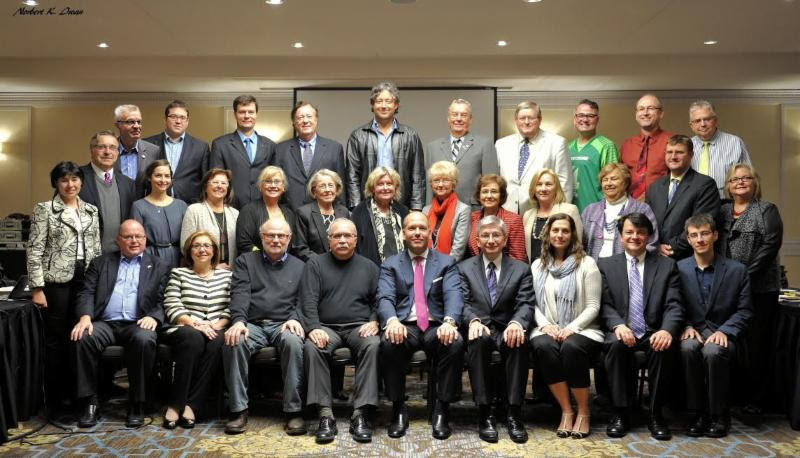 Community leaders and executive members came from each end of the country to meet and discuss the progress to this day and the plans of action the UCC will take to continue to represent Ukrainian-Canadians nationwide. The Bulava Award Gala Lunch was held to present members of the community in Manitoba that dedicate their time, expertise and efforts for the benefit of us all. 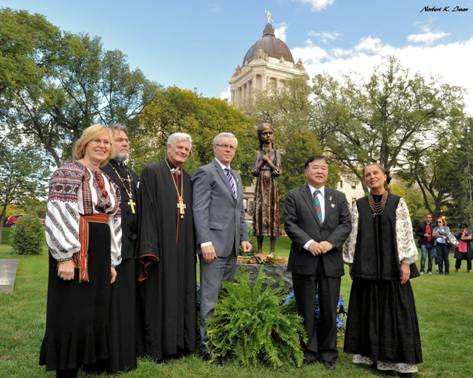 On September 21, 2014, the Ukrainian Canadian Congress – Manitoba Provincial Council sponsored the Official Unveiling of the Holodomor Statue: “Bitter Memories of Childhood” on the grounds of the Manitoba Legislative Building. 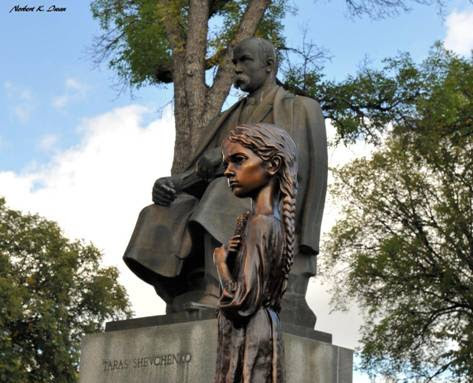 The statue is located near the monument to Taras Shevchenko. Dignitaries in attendance included the Lt. Gov. of Manitoba, Hon. Philip Lee, and the Premier Hon. Greg Selinger, Metropolitan Lawrence Huculak, UCC National President Paul Grod and the President of the Ukrainian World Congress Eugene Czolij. 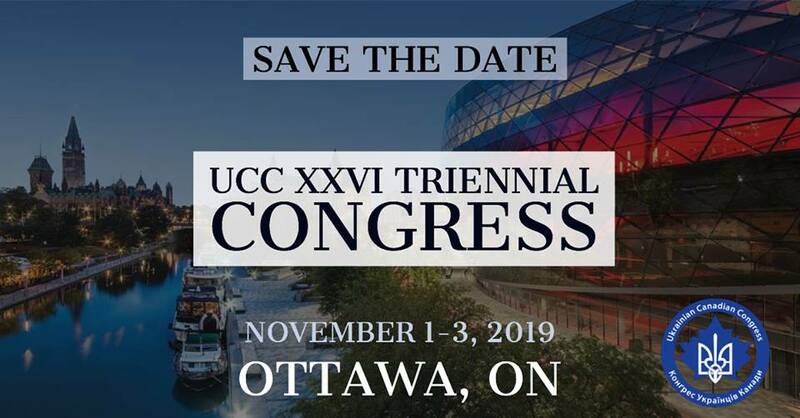 UCC-MPC wishes to express its gratitude to the its Holodomor Awareness and Education Committee co-chaired by Irka Balan and Valia Noseworthy. In addition, it thanks Vasyl Balan for his invaluable assistance. Special thanks goes to the Province of Manitoba for agreeing to have the monument placed on the territory of the Legislative Building, as well as providing technical assistance and arranging for the post-opening reception. The monument is an exact copy of the statue which is located at the entrance to the Holodomor Memorial Museum in Kyiv, Ukraine. The Holodomor (Ukrainian: Голодомор, “Extermination by hunger”; “to kill by starvation”) was a famine in Ukraine in 1932-33 that killed some seven million people. The Holodomor was conceived and executed on the orders fo Josef Stalin. Grain and other foodstuffs were requisitioned from Ukraine to such a degree that the local populations was left with nothing to eat. This was done to break the Ukrainian people’s opposition to forced collectivization of agriculture and its national resistance to Soviet rule. 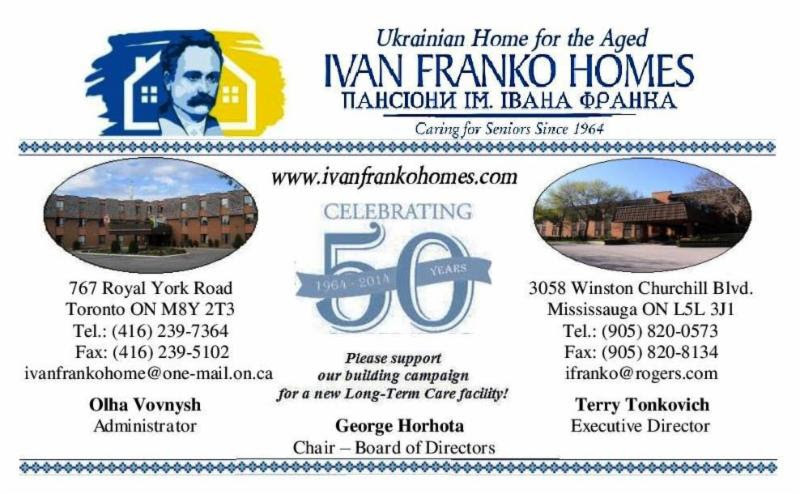 In 2006, the Holodomor has been recognized by the independent Ukraine and several other countries – including Canada – as a genocide of the Ukrainian people. For more photographs from the event, click here. 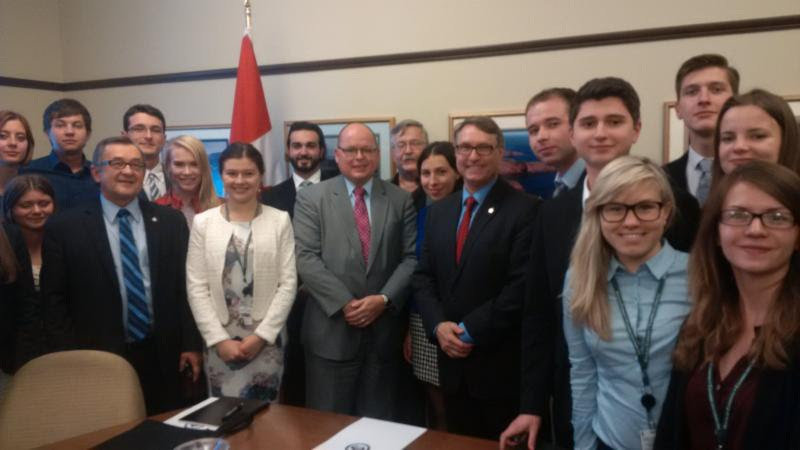 23 September, 2014 – Ottawa – The Ukrainian Canadian Congress (UCC) sent delegates to meet with Members of Parliament to discuss the issue of the status of Ukraine, the combat in the Eastern region of the country and President Putin’s continuous involvement in Ukrainian affairs. The delegates met with over 20 MP’s including Liberal Party Leader Hon. Justin Trudeau and the Canada Ukraine Parliamentary Friendship Group headed my Mr. Ted Opitz, MP. 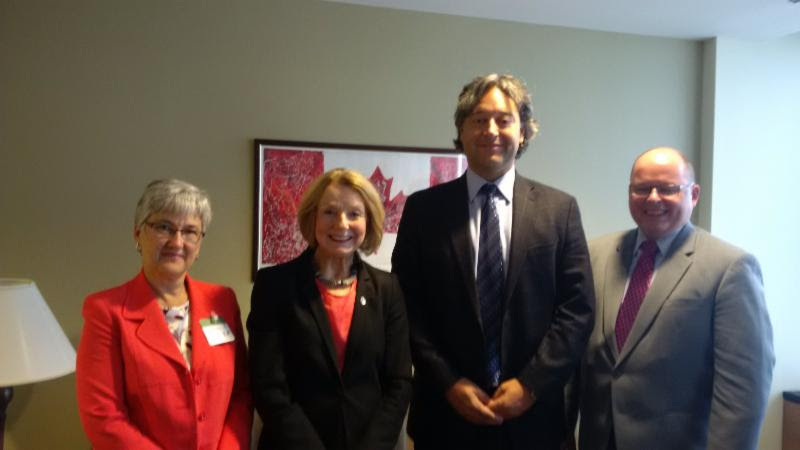 The Canada Ukraine Parliamentary Friendship Group is a group of Parliamentarians that are united in working with the UCC as well as its partners in the community, to address issues and concerns dealing with Ukraine and its people. The current topic of discussion is the urgent call for military and medical aid for the people and soldiers of Ukraine, where on-going combat is occuring between Ukrainian soldiers and Russian regular armed forces and Russian-backed militants. Mr. Opitz along with Mr. James Bezan M.P., Mr. Ed Komarnicki M.P., Senator Raynell Andreychuk, Mr. Mark Warawa M.P., Bernard Trottier M.P., Linda Duncan M.P., Mr. Mike Wallace M.P. as well as others met with our delegates. Our delegation included: Mr. Taras Zalusky, Dr. Markian Shulakevych, Mr. Borys Gengalo, Mr. Yaroslav Baran and Mr. Michael Hrycak. They addressed the pressing issues concerning Ukraine and its people and informed the parliamentarians as measures taken by the community to support our ancestral homeland and what additional measures the government can take to provide further assistance. The overall consensus of the day was very positive. Our delegates reported that the Parliamentarians listened intently and truly understood our plea. They responded with utmost assurance that they will continue to promote and assist in supporting Ukraine in these troublesome times. Kremlin’s fear of Ukraine’s revolutionary potential. Medal from the Council on Foreign Relations. the Warsaw correspondent of the Economist magazine. For a map to get to the venue, click here. The Ukrainian Resource and Development Centre (URDC) at MacEwan University in Edmonton, Alberta has sent out a news release about 5 awards that are available to students and the genral community for this fiscal school year. The URDC is calling for everyone eligible to apply for the five awards below. Application forms and guidelines are available at the URDC. Application deadline is Sunday, November 30, 2014. Alberta Council for the Ukrainian Arts (ACUA) Award ($500) – is offered annually for a project that fosters a greater awareness of Ukrainian art in Alberta. Project may be in the form of an exhibit, tour, festival, educational program or special project. Roman Soltykewych Music Scholarship ($500) – is available to applicants (single or group) determined to pursue further studies in the field of Ukrainian choral or vocal music. Serge Eremenko Music Award ($500) – is available to applicants (single or group) planningto pursue studies in the field of Ukrainian music. Completed or on-going courses or workshops will be considered. William and Mary Kostash Award for Media Arts ($1,000) – is available for any project which promotes Ukrainian Canadian identity through film, video or multimedia. President’s Club, whose donations help us achieve our goals.